STEPHEN ROCHFORD REFUSED to bemoan his side’s bad luck after seeing Mayo draw with Dublin in an enthralling All-Ireland SFC final today. An incredible opening saw Mayo concede two own goals in the opening half, before rescuing a draw in the dying stages, after Cillian O’Connor registered a dramatic last-gasp point. Reflecting on the game, the Mayo coach said: “You don’t feel sorry for yourself… We said we weren’t going to have regrets about certain things that would happen during the course of the year and during the course of the game. While Mayo showed tremendous heart and mental strength to get back into the game despite finding themselves trailing by three points in the dying stages, Rochford felt there was room for improvement in certain respects. We’d be fairly disappointed with a number of aspects of the game. We contributed enough to the concession of the two goals, some people may feel they were unlucky but you make your own luck. Rochford also played down suggestions that Mayo had missed a glorious chance to end their 65-year wait for an All-Ireland SFC title, with Dublin at times looking below their best. That may be a story that will run in two weeks’ time but at this moment in time we’re still in the fight so it really doesn’t change our thought process. 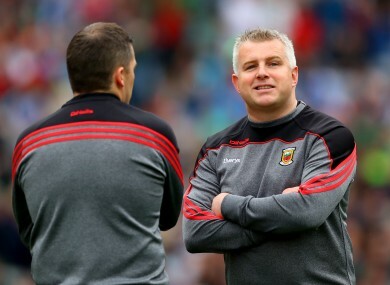 Email “'You don’t feel sorry for yourself' - Stephen Rochford on Mayo's two freak own goals”. Feedback on “'You don’t feel sorry for yourself' - Stephen Rochford on Mayo's two freak own goals”.